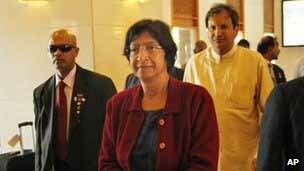 United Nations Human Rights High Commissioner Navaneethan Pillay arrived in the country yesterday on a week-long official tour. Navaneethan Pillai is currently engaged in a discussion with Chief Justice Mohan Peris at the Hultsdorf courts complex. Subsequent to the meeting with CJ, Navi Pillai is scheduled to meet the attorney general and Justice Minister Rauff Hakeem. Issuing a statement Colville stated, “Pillay is scheduled to call on President Mahinda Rajapaksa, and meet government ministers and officials.